A great group instruction center or workstation! 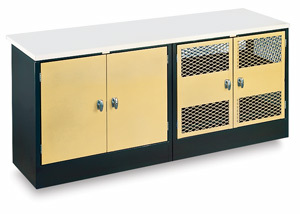 Separate cabinets are joined by an overlaid 1¼" thick, moisture-resistant laminated top. The damp cabinet keeps works in progress workable, and features a double-walled exterior, aluminum interior, and airtight doors, 2 bolt-on shelves. The drying cabinet dries, protects, stores greenware and features steel mesh walls, with 2 perforated steel shelves for effective circulation.